Do you feel as though you're not enough? That no matter what or how much you do, it will never be enough? That you are unworthy of good things in your life? Once again, consider yourself not alone. I used to have steady streams of thought that told me in one way or another how I never measured up. It hit me in all aspects of my life. My job. My work at home. My friendships. My intimate relationships. Everything. These were messages, tapes actually, that I had embraced as my own from others in my life. Others who were responsible for me when I was a child. But I was no longer a child. No one was telling me how unworthy, I was. How not enough I was. Except for me. I expected perfection in a world that was far from perfect. But what was interesting is that I expected from myself what I never expected from anyone else. But even within my own ever-changing definition of perfection, perfection was completely unachievable. Because no matter how perfect I had done the job, I kept setting the bar higher and higher. Making perfection out of reach. Then one day I was tired. Exhausted to the bone. Figuratively and literally. I finally asked myself a few questions. Why do you expect so little from everyone else? Why do you give them a pass and endless second chances, but not even an 'atta girl' for yourself? Why never a pass or a second chance for yourself? What makes you so bloody special? By what decree do you get to define perfection for yourself in a way that is attainable only for you but no one else? And as I asked myself these questions, I was stunned by the sheer arrogance of my thoughts. Bet you didn't expect me to say that now, did you? But it's so true. Arrogance was the best way to describe what was at the base of my thought process. And then a revelation. My thoughts were the culprit. And if my thoughts were responsible, the embarrassingly simple answer was to change my thoughts. This revelation was without a doubt life-altering. So how do you get passed the idea that you are not enough? When you catch yourself saying something negative or when you expect too much from yourself, make a point of turning that thought on its ear. But change can only come about through awareness. Knowing that it's happening in the first place. Now don't get me wrong. This doesn't mean that standards and lofty/noble goals are no longer required. Dream BIG. REALLY BIG! REALLY REALLY BIG! But there's a huge difference between a standard of doing a job well and doing it to absolute perfection. Understand that perfection only exists within someone's mind. In other words, it really doesn't exist at all. Except within your own imperfect judgment. What does exist is your ability and drive to do good. Good enough. An ability and drive to do a job/project/chore/etc the best you can in the moment you're doing it. And then don't forget to celebrate, truly celebrate each and everyone of your achievements. 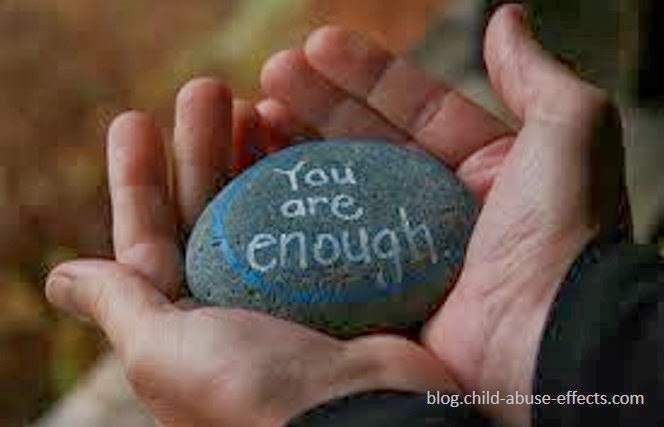 You are not only enough. You are enough, perfectly.